Pictures courtesy and Copyright David McInturff. This is the first reported example of this tiny vase, or possibly a shot glass / small tumbler - it is only 3 inches tall. 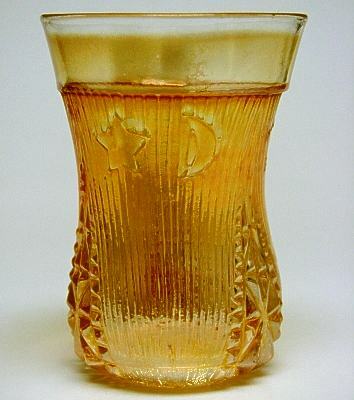 It was probably made by Jain Glass Works, India (attribution based on the various pattern elements which are very much like items that are known to be from the Jain factory). Reported and named by, and Copyright David McInturff.